This course focuses on the key mathematical concepts that you’ll encounter in studies of machine learning. It is designed to fill the gaps for students who missed these key concepts as part of their formal education, or who need to refresh their memories after a long break from studying math. This course provides the level of detail needed to enable engineers / data scientists / technology managers to develop an intuitive understanding of the key concepts behind this game changing technology. In this course, you will be given a thorough overview of Natural Language Processing and how to use classic machine learning methods. Validate the skills and knowledge you’ve acquired during the Microsoft Professional Program for Artificial Intelligence, and solve a real-world AI problem in this program capstone project. The project takes the form of a challenge in which you will develop a deep learning solution that is tested and scored to determine your grade. Note: This course assumes you have completed the previous courses in the Microsoft Professional Program for Artificial Intelligence. Booking Options: We offer two options to reach your Certificate in Artificial Intelligence! 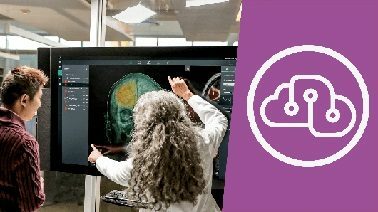 Do you have any questions about the Microsoft Professional Program for AI?